Early in June 2011, a renter for our off-grid house appeared! This will free us to travel for extended periods. A major downsizing opportunity! We are retaining Robyn’s room for long-term storage. The guest space adjoining our garage will be our backup residence. All told, we’re moving from a 1500 square foot house into about 768 square feet (but actually living in only 200 square feet in the RV). (By comparison, our hero Dee Williams’ portable tiny house has about 84 sq-ft downstairs and a 49 sq ft sleeping loft, and a 14 sq. ft. front porch. Indoors total is 133 sq. ft. We’re doing pretty well with 200 sq. ft. for two of us, which includes two work spaces). We have about eight weeks to move out of the house. Weeks 3 and 5. Janaia’s mother Rowena (Ms. Clean) comes for two weeks and gives us a mighty good kick start. Rowena takes away two packed van loads. Weeks 1-7. Janaia staging stuff to go out. Buckets of emergency food storage grains go to a friend. Every week. Pack it out! 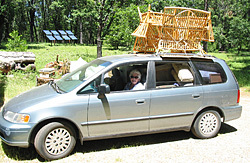 So far, three utility trailer loads (with Janaia’s art studio and other furniture), seven van loads packed to the rafters (above), and seven large boxes shipped. Week 7. Robyn’s room with edit bay (left), art and office storage (center), and long-term storage (right). More downsizing opportunities abound. Week 8. Janaia drops. Marathon over. At least this phase. We’ve simplified. We feel much lighter and easier. We’re letting go of ideas and identities along with stuff. I’ve let go of the notion of Lone Bobcat Woods being the hub for a residential community. Our call for now is to be vagabonds taping Peak Moment shows in the wider world. We’re energized to follow that call, not knowing where it leads, but looking forward to its unfolding. And happy to have less stuff in the little red wagon we’re pulling behind us. I will be in California in October, Oregon in November, Washington in November, Hawaii in December…any chance of overlap?? good luck as nomads. Patrick and I have enjoyed 9 months with merely a backpack and even that feels too heavy. All our stuff fits now into one room at my parents. So we’re in the same boat…homeless. It teaches how little you really need and how much you already have! Blessings to you both Robyn and Janaia as you navigate the changes before you. May there be much richness in this for you. Please remember, we have camping space for you here in the Midwest (Stelle, IL). You truly are an example. I’ve started my downsizing (mostly paper accumulation right now, but more solid things to come). I hope I don’t lose touch with my inspirations – namely, you two. May your road always be smooth (or at least less bumpy). Smiling – the lightening process becomes easier and easier. Yet, per my experience, the temptation to reacquire – even the smallest of things – is never far away. Thus, continually renewed intention is most beneficial:) Perhaps Lone Bobcat Woods will one day become such a hub – but with others at the helm. And, being vagabonds/sojourners seems as if there would be as much potential for being resilient as being homesteaders – simply in different ways. Exciting times to be embarking upon new adventures. Blessings in your travels. Welcome to the “full-timing” RV lifestyle. My wife and I did that for 3 years before we got the itch to settle down. Happy memories. And we did not miss our stick house that we sold before going full-time. We recommend the Escapees organization as a good group of over 100,000 full-time RVers that will welcome you and provide any type of support you may want or need. We all should be scaling down thanks for setting an example. I have just received the books that you sent. Thank you. Well packaged and they all seem to be in mint condition. Did you read any of them? If you did you must have a beautifully light touch that librarians could only wish for in their wildest dreams. I admire your self discipline in the downsizing process. It would not be easy. Vagabonds? Of the best type of course. Thank you both for being a beacon in these turbulent times.